Anyone who plays SuperCountries will get Ether forever, even if they leave the game or have played only once, as long as the game goes on. 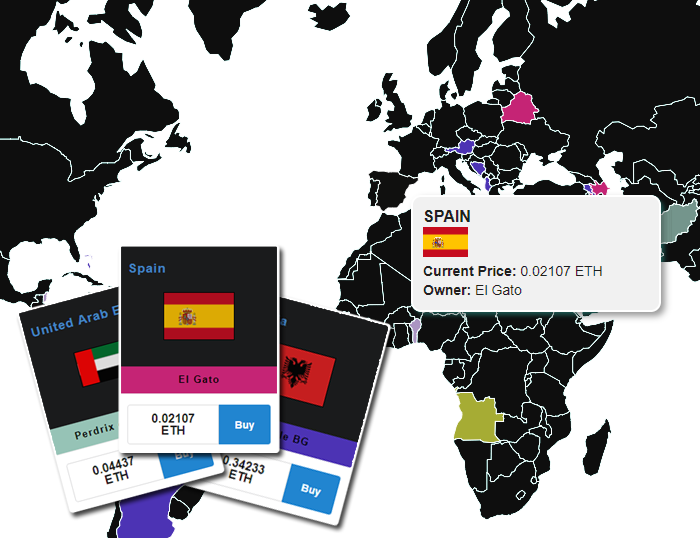 This is a very simple game where players conquer the world trading virtual countries using a cryptocurrency named Ether. Like in some games, you can make a profit selling your countries. But the most awesome part of SuperCountries is that you become automatically qualified for lifetime Ether just after entering the game ! Yes, once you have bought a country, you will be rewarded for life by getting all kinds of dividends, bonuses and regular jackpots. There are 6 ways to earn Ether (+ 11 new ways coming soon), see our FAQs for more details. This impressive mechanics is ruled automatically by a Smart Contract on the Ethereum Blockchain. Configuration: to play SuperCountries, you will need to install the MetaMask Browser Extension for your browser. This will allow you to execute in-browser purchases using Ether, the Ethereum Network cryptocurrency. Next, you will need to purchase Ether and transfer it to your MetaMask crypto wallet. A popular place to purchase Ether (instantly) is at Coinbase.com. See our FAQs for more details. Gameplay: get rewards by conquering countries on the map. As told above, every player will get lifetime rewards. To become a player, all you need is to buy (or have bought) at least one country (won countries don't count). No matter the price, no matter if you sell it right after. So first, pick a country in the marketplace to be immediately qualified for eternal dividends and rewards. After every buy, the price automatically increases. If someone else wants to conquer the same country, they can take it away from you by paying up to double the price that you paid. You will then lose the ownership of that country, but you will receive your profit in Ether automatically transferred back to your crypto wallet. From now, you are also qualified for lifetime rewards, even if you sell all your countries. You will get dividends proportionally to your current and past purchases, get bonuses when inviting friends and maybe win the regular jackpot. And of course, the more you play, the higher your rewards. Read our FAQs to learn how to increase your rewards. Fun advertising: this game is mostly made to have fun and dominate the world with your color and your name. Use the game as an advertising space for your brand, website, youtube channel or referral links. If you own a country, you own an advertising space and a color. Your nickname, which you can modify, appears on it and if your nickname contains an url, people can click on it. Your nickname (and color) is displayed multiple times : on the map, on the list of countries and for some players on the leaderboard of the top 10 current owners and all dashboards. SuperCountries has super player friendly value increase model with the super lowest commissions. When compared to other collectible games that take large commissions on each purchase, SuperCountries value the players. Check freely our open-sourced Smart Contract available for anyone. Each time a country is bought, how is distributed the net profit? 65% goes to the seller. The rest is distributed among all players as in the table. Of course, if a player falls into more than one category, the rewards add up! SuperCountries goes live with a minimal UI and limited marketing with the lowest entry prices. Our awesome feature (lifetime dividends for each buyer) is available at launch. Each player who buys at least one country will earn Ether dividends for each new transaction occurring in the game. After the launch, we'll control the first settings, listen to your feedbacks and gradually unlock all countries. Since the supply is limited, all countries should be unlocked before the end of summer and become more and more valuable. There will be regular contests to win the newly and last unlocked countries, ETH rewards and Trophy Cards (useful on Phase #3). SuperCountries Phase #1 was just the beginning, discover the additional game WAR and fight your countries! Win a huge war chest, earn ether by new ways and profit of the profitable power of Trophy Cards. Once in the game, the phase 6 is actually constant and will last forever. If one day the game slows down, a jackpot is set to be won many times and revive the game. And of course, since all players get dividends forever, each new transaction on any country means dividends for all.